Today on the YarnThing Podcast with Marly Bird: Patty Lyons, knitting instructor and doer of other crafty things! Listen in below if you missed it, or again because you love the show ;), to hear Marly and Patty talk about how she learned to knit and crochet, how she got into the business, her huge sweater story, and her various classes (sorry for the crackle in the audio, weird connections today)! Patty learned how to knit from her mother when she was little and did it on and off for many years, mainly in times of stress. She really started knitting c0nstantly when she was a stage manager on Broadway. Patty learned to crochet from her mother-in-law when she was an adult. After 22 years in the theater business, Patty was ready for a change. While she liked theater, she loved knitting and decided to make it her new career! 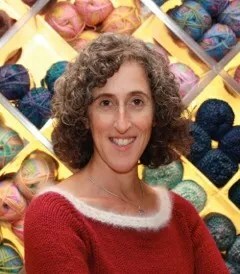 Her first foray into the world of knitting and crochet was managing a yarn shop in New York City. This was a great experience for her and taught her a lot about the yarn world, including that she really didn’t want to own a shop but she did like teaching and helping people understand the “why’s” of knitting and crochet. Her second step was to take a job at Lion Brand Yarns. She helped to set up the Lion Brand Yarn Studio in New York City and various other things at Lion. After a few years there, she started teaching classes at the big industry shows like Stitches, Vogue Knitting Live, and the Knit and Crochet Show (TKGA and CGOA guilds show). Patty now does teaching pretty much full-time in various venues including Interweave webinars (web seminars) and on Craftsy. Links for everything below! You can find Patty in many places including: her website PattyLyons.com, Facebook, Twitter, and Ravelry. And we can’t forget the GIVEAWAY! A slight change for this week, leave a comment below with Patty’s key phrase and use it in a sentence for your chance to win Patty’s Explorations in Cables Craftsy class! « Yarn Thing CAL-KAL with Marly Bird and WENDY BERNARD! Patty Lyons taught me how to correct my knitting mistakes in her online course! She is hilarious as a person and if she came over to my house for dinner, I would serve canned ham and ask her to show me more knitting techniques! Enjoyed her stories in the podcast! I enjoyed this podcast so much. Her story was so fascinating to listened too and sounded nothing like the canned ham routine of someone who doesn’t care about the message they are sharing. The use of canned ham for dinner means more time for knitting. Its was great learning about Patty Lyons and how she quit her $$$$ job to go with her heart in knitting. I can’t say that I have ever made canned ham but it sounds like it would be good with mash potatoes followed by a night of knitting. I love the Craftsy Class “Improve Your Knitting” which I purchased last weekend. I would love to take the class on cable knitting. Canned ham makes me smile !! What a great play on humor including being a canned ham. Patty Lyons is an amazing teacher, I saw her at VKL. My parents always had a canned ham in the refrigerator, yum! If you can knit and purl backwards and forwards,…..then can you tell the difference between canned ham and mah dennac? I would take canned ham over spam any day! Loved listening to Patty. You know she was the class clown! Great podcast as usual. I must put Patty on my craftsy wish list. Have you tried canned ham with mash and garden peas? It tastes great. I love Patty’s Improve your Knitting class and would love to take her Explorations in Cables class through Craftsy as well. I’m not really one for canned ham, but serving it would probably make more time for knitting Great podcast as usual! Canned Ham is delicious. Laughed at the story about the over sized sweater, I have done the same. Great interview as always!! I would totally fit in with your crowd lol. I am loud and apparently have a very distinctive loud laugh!! I even got in trouble for it at work during tax season for it. Anyways, I haven’t tried canned ham before as it freaks me out a little lol. Very fun podcast today. I’ve never had canned ham and don’t plan too. If I had some, I’d trade it in for yarn. Goodness Marly, I would never compare you to canned ham in any way! Great podcast, as usual. I’ve only been knitting for a couple years, but have been a crocheter since I was a kid. I am mostly a self taught knitter and apparently have an unusual technique. I would love to learn different styles to become more efficient and technically correct. Looking forward to some canned ham snacks to keep up my energy for projects! Great interview! When you go to Hawaii, you must try the canned ham specialty (spam sushi). The only thing that would have made my listening enjoyment better was to be snacking on canned ham with pineapple lemonade! i really enjoyed the podcast and have been tempted to take the improve your knitting Craftsy class, but wanted a little more info. It’s in my wishlist, so the next time I’m shopping for a class, I’ll have to scoot this one over. Thanks, Ladies! i enjoyed this podcast while knitting my lace project. I have never liked canned ham, but I would set some for the chance of a neat cratsy class! thanks for the knit away. In a world where acrylic yarn is like canned ham then alpaca is a fine spiral cut ham and koigu is a fresh pork loin roast. Yarn is such a sensory delight, I can make a meal on my stash. Thanks for a great interview Marly and Patty. I loved your reference to looking like a canned ham, but like your guest I think you look great just as you are! Loved the story about the gigantic sweater. Don’t we all do things like that. I don’t eat canned ham but it would be a great emergency meal. I can’t say that I’ve ever tried canned ham, but since I am a fan of ham in general I’m sure I would like it! I loved the podcast as usual, Patty was a great guest!! I remember having canned ham (Spam) in casseroles growing up, but I haven’t had it in years. Does anyone else remember the MASH episode where Hawkeye made a Spam lamb since the real lamb was sent to Iowa as Private Lamb by Radar? Patty was a great guest. I will put her Craftsy class on my wish list and check out the webinar. If a boy offers you a meal of canned ham you know he is not ‘the one’. I love that knitting is ‘the one’ for you and that you had the guts to dump the ‘other guy’. In a city where good meat (and nice wool) is not easy to come by (New Delhi), perhaps it’s time to turn to canned ham? Luckily nice wool is still plentiful on the internet!! It was lovely getting to know Patty on the podcast! I think we have a little “canned ham” in all of us . It makes the world go round, so to speak! Love all your podcasts, Marly. Thank you. Leave it to a theater person to put together canned (music) and ham (actors) to make canned ham. It sounds like I could learn a lot from Patty! I will admit that canned ham is a guilty pleasure for me–sliced and fried. I am not really a Canned Ham girl but I am all about canned Chili this time of year. Loved the show and love Patty! I ate canned ham often as a child but haven’t had it in years now. I much prefer Virginia ham! I loved learning more about Patty and the many things she is involved in. Thanks for a great podcast! I loved this interview….very entertaining! I have not thought about “Canned Ham” in many years, good memories! I enjoyed this podcast. I had the pleasure of meeting Patty briefly and Chain Link in 2012. As a vegetarian, I don’t eat canned ham, but it’s interesting to learn that Patty is apparently a fan of it. Patty is a hoot! I so enjoyed the show that I celebrated by buying a canned ham! Great show! I always love to listen. I cants wait to check out Pattys classes! Canned ham always makes me think of Christmas with the Kranks and the Hickory Hunny Ham! Looking forward to the next show! Awesome episode! Love Patty’s Knitting Doctor video class. I have never made a canned ham.